I'm personally a big fan of the camberspar, especially when running downwind. I can't tell you how many boats we've passed and had the husband run forward (often with a whisker pole) and try to get their foresail to do what we do with ease. If you plan your route correctly (Eastern Caribbean to Venezuela to NW Caribbean), you'll be able to experience a lot of down-wind sailing. Perhaps you can get better performance to weather with a roller furler, deck tracks and cars, but then you're beating (and losing a good chunk of what Freedom's are known for) and your admiral probably won't be happy with the contents of your home getting tossed around down below. (Not that I know that from experience...) On the plus side, not having to go forward to drop the jib would be very nice, as would being able to partially furl the jib. Hey, it's a boat and everything is a compromise! Also, I find that while the camber spar can get in the way while anchoring, a nice hip check will position it to the side and it's not that hard to work around. Given that you've got a manual windlass, I would spend the money upgrading that as you're going to spend a LOT of time at anchor and the manual part of the windlass will get old very quickly. Now, as to the in-boom furler, I'm not a big fan of them as you will want to maintain the fully battened main, and the issue is that in boom furlers tend to get jammed at just the wrong times. If you think that it's a pain getting on the steps to attach the halyard (which I can imagine that it is...I'm 6'3 and can just reach it),having it get jammed in bad weather sounds terrible to me and I've heard too many horror stories. I don't know if I shed any light on to the subject, but the good news is that my advice is free and worth every penny! Everyone has to find what works for themselves and it'll take a while to figure that out on your own. I've refitted most of my systems 2-3 times before getting things right for me and I'd still like to make modifications. Your boat name has been borrowed. We just returned from the Chicago Boat Show, where we saw a beautiful new 40 footer called a Blue Jacke 40. Base boat runs around $400 K and is a collaboration between Tim Jackett and Bob Johnson... Built by Island Packet. Beautiful boat... Only major flaw... wires are required to hold the mast up. Your boat name has been borrowed. We just returned from the Chicago Boat Show, where we saw a beautiful new 40 footer called a Bluet Jacke 40. Base boat runs around $400 K and is a collaboration between Tim Jackett and Bob Johnson... Built by Island Packet. Beautiful boat... Only major flaw... wires are required to hold the mast up. Yeah, I've seen it and am trying to get royalties on the name use! t-23 hours and we'll be on our way to the Mexico. Sue has bags packed and now we're pretty much just finishing up last minute stuff around the house. We're getting ready to head back to the boat. By this time tomorrow we'll be in the air headed to the Pacific side of Mexico where BlueJacket has patiently been waiting for us. This should be an amazing cruising year as we'll sail from Puerto Madero, Mexico which is the southern most port in Mexico, to Guatemala, El Salvador, Nicaragua, Costa Rica and Panama. We'll take BlueJacket through the Panama canal and leave her on the Atlantic side for hurricane season. 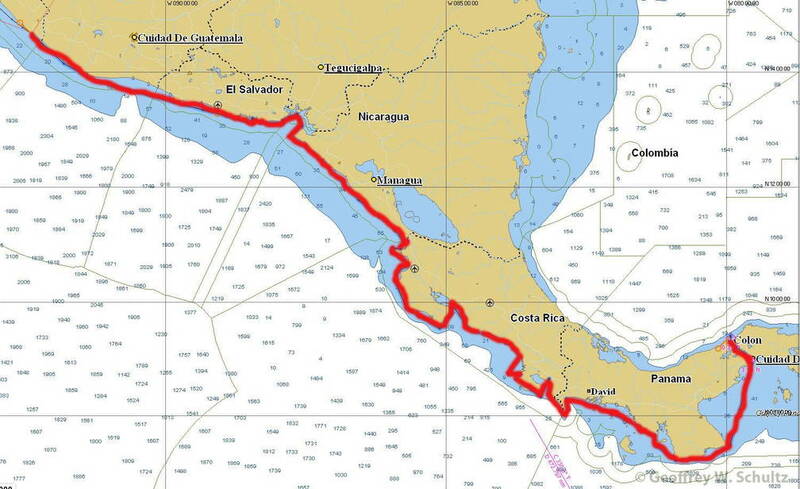 We've been working our way down the Pacific side of Central America and are now located in Costa Rica, where we plan to spend about 2 months before heading to Panama and then through the canal. I've been blogging about it (http://www.geoffschultz.org/Log_Page_Index.php?region=2014) and photographing as I go along (http://www.geoffschultz.org/photos/index/category/2014_cruising). It's been a trip wit lots of mechanical/electrical issues (all dealt with) and lots of wind, but thankfully we're through the worst of the wind. Anyhow, check it out it if you're interested as it's not a place that lots of cruisers visit.